I have been riding now for about forty years and for the life of me I can’t remember how I learned, or if anyone even showed me how to. In my mind it would go something like this-Summer, 1974…Hot and dry as July always goes. 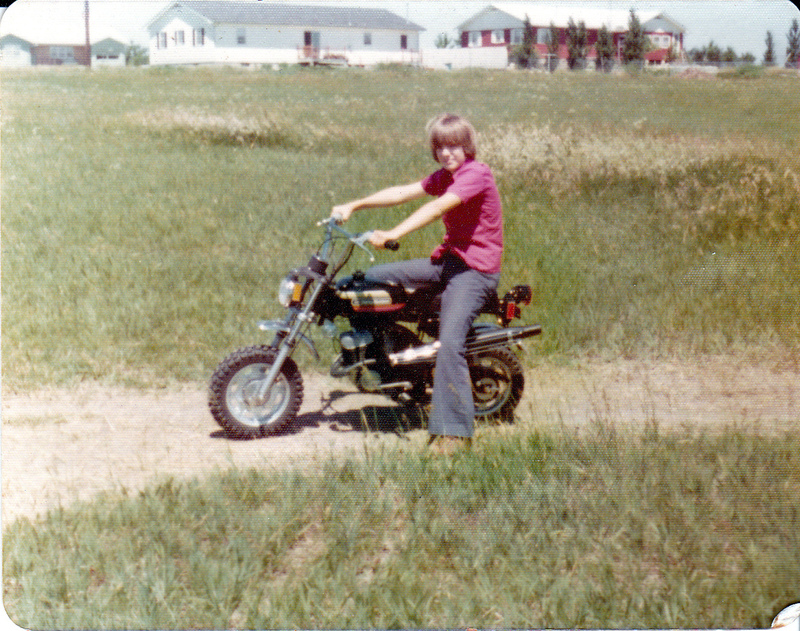 Shirtless and shoulder length hair (as the seventies always go) I hop on my first “motorcycle” and tear out in a cloud of dust, shifting through the gears with the front wheel in the air. My friends standing there in awe at my skill and daring attitude. No fear, just guts. What actually happened is far from that. You see, I had broken my right leg about a month before and I had a plaster cast on it all the way up to my, ahem, crotch. So kick starting was impossible. Heck, bending my leg to put my foot on the peg was impossible. So there it sat. Every day for about a month I would look at it and sit on it all the while my friends were asking “when” and “can I” every five minutes. But July was still hot and dry-my hair was shoulder length and I didn’t know how to ride a motorcycle. After the cast came off, my poor scrawny leg was weak and I wasn’t very sure-footed. Kick-starting the bike was a bit difficult and I was sure at any time my ankle was going to break all over again. But kick-start the bike I did, and from some place deep inside me I could ride. Ride like I’ve always ridden before…wait, that’s how it was going in my mind. What did happen was more like this-I let out the clutch and I kill it. Kick it again and repeat. But it didn’t take long and before I knew it, I could ride. And it was easy. I was a natural and even though I favored my right leg (always turning left-perfect for the Springfield Mile) it was something that came easy to me. I spent countless hours and miles riding that Harley-Davidson x90 only stopping to cut grass and gas up. I sure didn’t stop for a hair-cut.